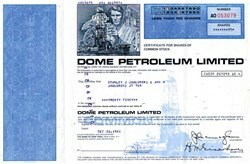 Beautifully engraved uncancelled stock certificate from the Dome Petroleum Limited issued in 1981. This historic document was printed by the B.A. Bank Note Ottawa and has an ornate border on the left side, a faint blue image of an oil tanker in the bottom right corner, with a black and white vignette of a man pouring liquid from one jar to another, with an oil tanker resting on the waters below him and a factory behind him. This item has the printed signatures of the Company�s Chairman, Jack Gallager and Secretary, and is over 30 years old. Folds from original shipping. Dome Petroleum Limited was a Calgary-based petroleum producer in the Alberta oilfields. 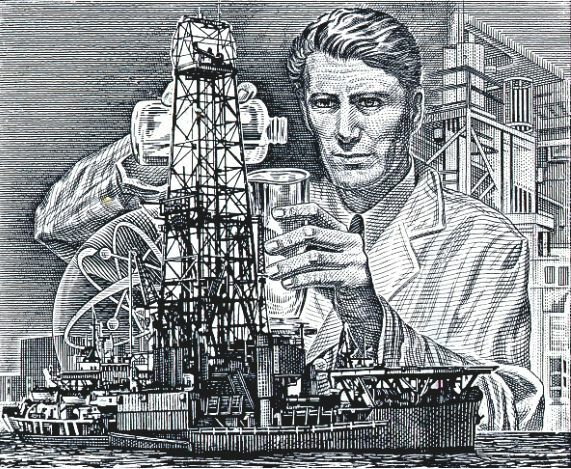 Jack Gallager joined a group of investors in Dome Exploration (Western) Ltd. in 1950 and built it into the major Canadian oil company Dome Petroleum Limited (to which it was renamed in 1958). Gallagher was the sole employee for the first two years. However, James McCrea, who was instrumental in building Dome Mines into one of the giants of the Canadian mining industry, is credited with originally creating Dome Exploration (Western) Ltd. Charles Dunkley was Dome's third employee and became Dome's Senior Vice President and Jack's management partner. "Charlie" had a reserved management style and the pair worked well together especially in the early days when they ran a tight management ship. Dome grew by making acquisitions in the energy industry, notably the 1981 acquisition of a 52.9% interest of Hudson's Bay Oil and Gas Company Limited through its wholly owned subsidiary, Dome Energy Limited. Dome was active mainly in Western Canada, the Beaufort Sea and the Arctic islands. The company developed serious problems as a result of the 1986 drop in world oil prices and substantial debts from past takeovers. In November 1987, after months of negotiation, an agreement in principle was reached that to the sale of the company. Upon his death, Gallagher was recognized as a masterful lobbyist and a pioneering, if controversial, figure in the history of Canadian energy development. Stock research by OldCompany.com (old stock certificate research service).